Dundalk FC suffered a second successive defeat and they could have little argument about the result as they went down 2-1 to struggling Sligo Rovers at The Showgrounds on Friday night, losing further ground in their SSE Airtricity League Premier Division title defence. They were stunned after just 26 seconds when Romeo Parkes fired Sligo in front. The home side should have been further ahead, only for Daryl Fordyce to fluff his lines in front of goal and then Parkes hit the post in another one-on-one. Patrick Hoban levelled for Dundalk from the penalty spot, but by half-time Sligo regained the lead when defender Dante Leverock scored from a corner. Vinny Perth emptied his bench in search of an equaliser, but it was his goalkeeper Gary Rogers who kept them within touching distance as he worked wonders to deny Fordyce with just over a quarter-of-an-hour remaining. But it ultimately mattered little as Sligo held firm for a huge win. The Lilywhites now trail leaders Shamrock Rovers by 13 points and drop to fourth, below Bohemians and Derry City. Despite a below-par performance seven days earlier, Vinny Perth stuck with the same starting XI that lost their unbeaten record at St. Patrick’s Athletic in Dublin. The substitutes’ bench also remained unchanged. There were some positives in the build-up to the game, with long-term absentees Chris Shields (knee), Patrick McEleney (metatarsal), Stephen Folan (knee) and Robbie Benson (foot) all going through various work-outs with the club’s two physios on the pitch. 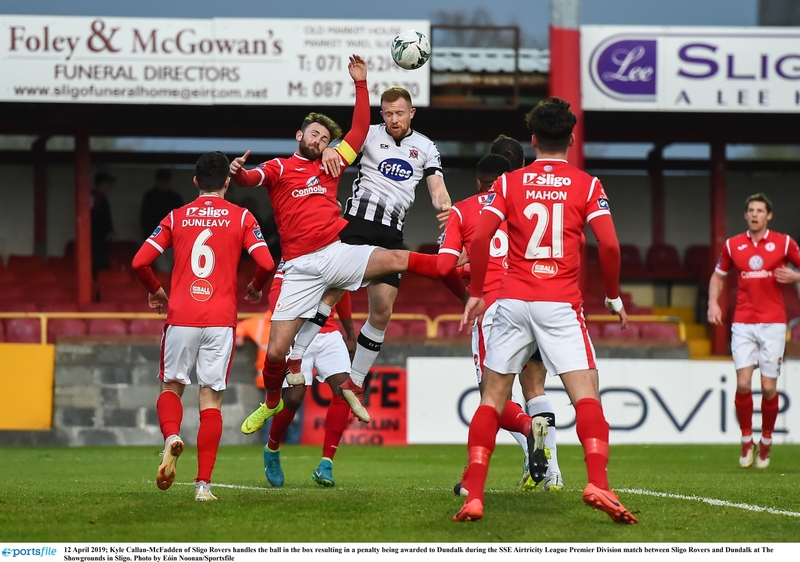 Sligo were under pressure to perform, sitting second bottom of the table and with home supporters having witnessed just five wins in 22 attempts over the previous 14 months. They had, of course, held Dundalk to a 1-1 draw at Oriel Park on the opening night of the season. However, one of their heroes from that – young stopper Ed McGinty – missed out here with a finger injury. He was replaced by former Chelsea youth, Mitchell Beeney. Meanwhile, Sligo forward Ronan Murray missed another date with his ex-club, this time through suspension. Here, like in February, the Bit O’ Red stunned Dundalk. This time, it was much quicker. Ronan Coughlan kicked the game off and 26 seconds later he was the creator of the opening strike as Parkes blasted in from close range. On 11 minutes, it should have been 2-0. Coughlan again caused problems and the ball fell kindly for Fordyce who controlled with his head before racing through on goal, but with just Rogers to beat, he dragged a poor effort wide. Dundalk almost punished that miss immediately as they broke at pace, with Seán Gannon raiding forward. The hosts cleared the initial cross but it came to Jamie McGrath whose 20-yard strike took a deflection off John Mahon and spun narrowly wide of the post. The Lilywhites survived another huge scare on 21 minutes. Fordyce played a through-ball for Parkes who scooted away from Brian Gartland, and in a one-on-one, his shot went past Rogers but struck the bottom of the post. Dundalk were given a way back into the game soon after when left-back Lewis Banks handled in the box. Hoban stood up to dink the spot-kick down the middle, as he erased memories of his penalty miss against the same opposition two months ago. Sligo, though, remained dangerous and they deservedly retook the lead three minutes before half-time. Parkes had done well to win the corner, which was floated in by David Cawley to the back post, where centre-half Leverock bundled the ball into the net. At the interval, skipper Gartland was replaced by John Mountney who went into central midfield as Seán Hoare was shuffled back to defence. That switch failed to lift Dundalk, as it was Sligo who continued to look the more threatening, particularly through ex-Huddersfield Town youngster Coughlan. His trickery frustrated Hoare into picking up a yellow card, one of four on the night for the visitors. Georgie Kelly was thrown in on 63 minutes, in place of namesake Daniel, and he was soon followed in by Joe McKee, as Perth used all his options. However, it was Rogers who kept Dundalk in the game on 74 minutes when he brilliantly tipped over from Fordyce. Still, that save was not enough to prevent another loss, as in truth the Oriel Park outfit never looked like salvaging a point.